When my son and his wife lived with us this past winter (while doing their internships for college), we really had a fun time together. 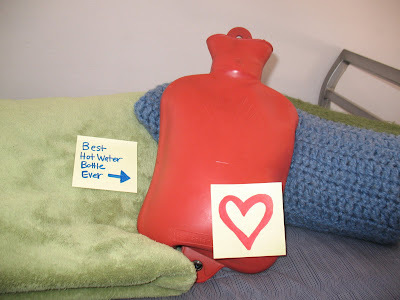 One of the things that stands out in my mind, (which quickly reminded me of the difference in our ages) was...when Brad got hurt or was sick, I got him the Hot Water Bottle out. ( Now just a side note here, Brad and Krystal love old things, old records, old clothes, yes they think the more vintage the better.) So when they saw the Hot Water Bottle they were thrilled, they couldn't believe I still had one of those. Then they went on to tell me, that they don't even think Hot Water Bottles are made any more. By the way they went on, I wondered if I should even be using it, or put it away so that I can sell it and be rich some day? It was just a reminder that I am getting older! :) Oh well, it is going to happen, it just seemed it came faster than I realized. I smile every time I get that ( old, vintage ) Hot Water Bottle out and realize that I am now the Grandmother ( Nana ), and many of my things will be consider antiques before long. I guess that isn't so bad. I actually have a lot of my grandmother's things in my home, they too, are considered antiques. I love having my house filled with them, it reminds me of her home and that was a good memory. So hopefully, I provided Brad and Krystal a few sweet memories for the future!